Credit card rates have held fairly steady for the last month, but remain at historically high levels after the recent manuevering by issuers ahead of the full implementation of the new Credit Card Act in February. The overall average rate of 16.28% is actually down slightly from December's 16.36%, but still represents the secong-highest average calculated in our survey since its inception in 2005. And, with most cards offering variable rates that rise with Federal interest rates, there is nowhere to go but up, as Federal rates are still at an all-time low. Breaking down the averages further, the average credit card rate for non-reward consumer credit cards rose slightly this month, up to 14.75% from 14.67% last month. The average rate for credit cards offering rewards slipped down a bit, to 16.94% from its all-time high of 17.09% last month. While the averages listed above attempt to take into account the multiple tiers that many credit card issuers offer, IndexCreditCards.com also tracks the very lowest listed rates, those reserved for customers with the very best credit. For the market as a whole, customers with excellent credit are now seeing an average rate of 12.34%, good news compared to last month's 12.58%, and more evidence that excellent-credit consumers still have decent options in the new credit card rate environment. Breaking that rate down further, the average rate excellent-credit customers can expect on non-reward cards remained 11.0% for the third straight month, while the average excellent-credit customers could expect on reward credit cards fell to 12.91%, after last month's half-point jump had taken that number up to 13.25%. No changes to the average rates on business credit cards -- the average rate for non-reward business credit cards remains at 13.39%, while the average rate for business credit cards with rewards remains at 14.53%. The average student credit card rate increased again this month, although not as dramatically as last month's half-point jump. The current average credit card rate for student applicants is 16.00%, up from 15.91% last month and 15.33% back in November. 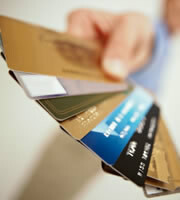 0 Responses to "Credit Card Monitor - Current Average Credit Card Interest Rates"